Oslo, Norway’s southern coast capital at the head of the Oslofjord is a city so clean, streamlined and safe that while there I dreamt about the possibilities of a city like this in America. Everywhere in Oslo, Norwegians seemed happy with their way of life. They drink fresh water right from the tap, health care is not a worry, and the whole country appears very well off. Oslo is like a best kept secret, one you don’t want to share with anyone for fear of the word getting out and mobs of annoying tourists showing up. Oslo’s new cultural center was once a haven for smugglers, thieves, scoundrels, and prostitutes in the 18th century. Now Tjuvholmen (Thief Islet) is a modern hideaway where Jay Z, Mariah Carey, Lena Dunham, and other famous Americans have stayed. The hip, luxurious setting on the water is filled with carefully selected designer furniture, global Nordic cuisine, a lavish spa (that you can enter privately from your room through an underground tunnel), and ultra-chic rooftop and library bars. Grand, bold, expensive art greets you at every turn – like a piece in the elevator with moving eyes. 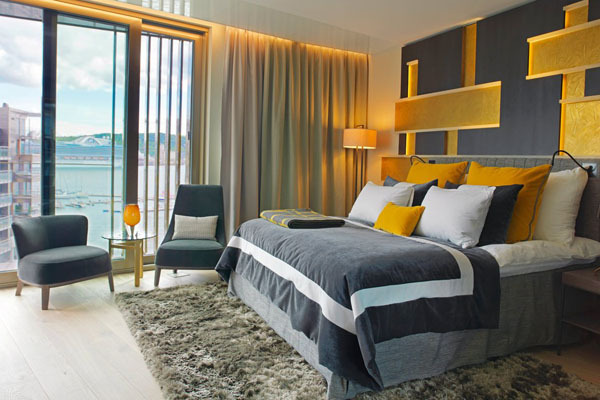 What sets this hotel apart is not only the location on the edge of the fjord (in walking distance to all of the trendy eateries and shopping) but the hotel’s attention to detail, service, room comfort, food, and cosmopolitan design. The staff takes great pride in your personal care, and they make you feel comfortable as soon as you arrive. Room features that made our stay that much better included heated bathroom floors, luxurious down duvet bedding, verbena tea and cookies at night with turndown service, private balcony waterfront views, décor in soft lush rich tones, and rainfall showers. Interactive TVs in each room offer ‘Art-on-Demand,’ themed maps such as Oslo Escape Routes take you on a curated tour of art, design and architecture, and the hotel’s Riva boat is ready to take you around the fjords all summer long. 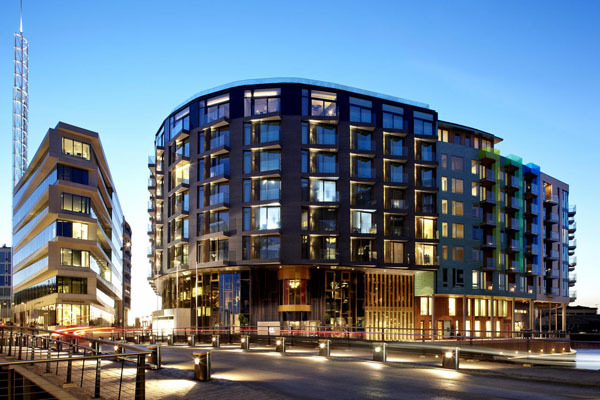 “Escapees” can be brave like a Norwegian and take a dip in the clean Oslo Fjord, or venture next door to the Museum of Modern Art to view Jeff Koons, Damien Hirst, Barney and many more pieces with your free hotel access ticket. Find tranquility at the spa’s glowing pool, sauna, steam room and hammam/massage treatment area. At The Thief hotel, we enjoyed one of our favorite wine-paired dinners off a global menu with a Nordic twist in a warm elegant chic setting. The melt in your mouth fish was a standout of the menu. 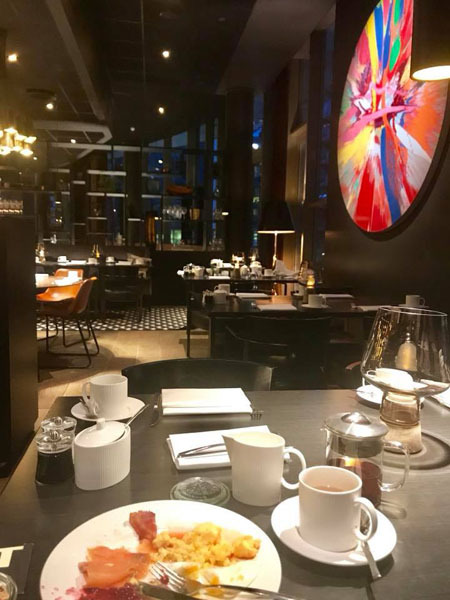 The Thief features an endless variety of healthy breakfast options, where loose leaf tea and fresh brewed coffee in a personal pot are brought to your table, while healthy juice shots and blended concoctions served in little glass jars were too satisfying. The organic, sustainable, and locally sourced ingredients were the best way to start each day, with options such as bacon, eggs, croissants, beans, cheeses, or fresh yogurt with a myriad of seed, nut, and dried fruit toppings. This chic waterside Japanese restaurant specializes in the best sushi and robata grilled dishes. Upon entering, we gazed at the King’s boat while devouring endless plates of sushi – like uni, salmon with mango and honey dressing, tuna in truffle soy sauce, and smoked halibut with soy onion sauce and goji. We learned that we were sitting in Jay Z’s seat on his last visit and he had ordered a large sushi take-out for his jet ride out of Norway. 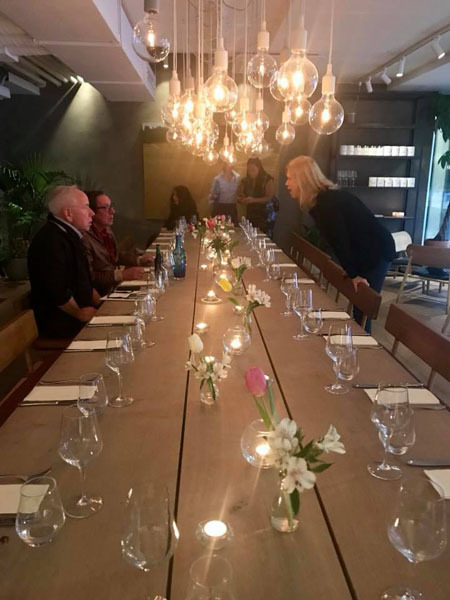 This is Oslo’s first true social dining experience – with a long communal eating table that seats 24 people. The lovely owners set out to change the way people eat. 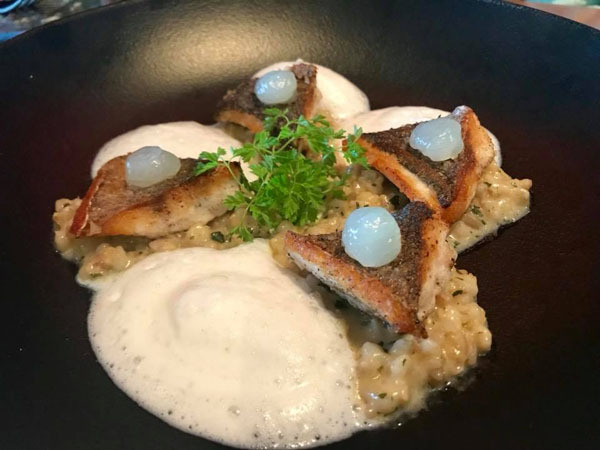 Expect a clean sleek setting with farm to table, organic, seasonal, Nordic cuisine. Enter through this beautiful white-themed courtyard filled with boho rustic furniture and pass the tiny indoor bar. 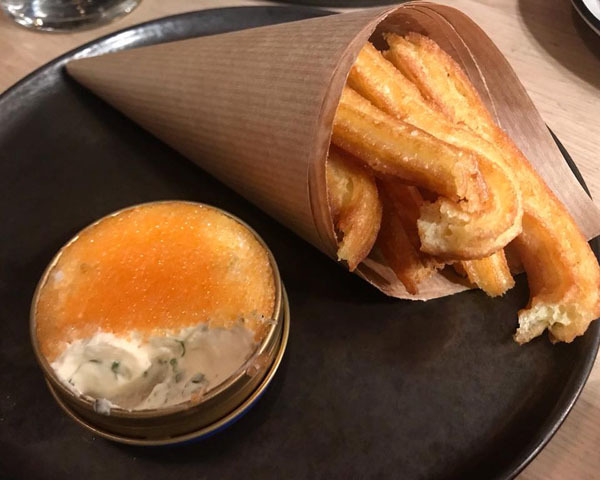 Dine on nouveau Nordic cuisine “showcasing the full potential of the seasons” like grilled cabbage, potato churros with sour cream and fish roe, deep fried shallots (like an onion ring), and cured duck with a crispy waffle. or the Beta Cocktail (a favorite) – a mix of Himkok vodka, carrot juice, ginseng, grapefruit and a dash of horseradish. Known as one of the best coffee bars by day, this coffee roaster focuses on sourcing directly from the best coffee farmers around the world in a relaxed atmosphere with mid-century modern design. 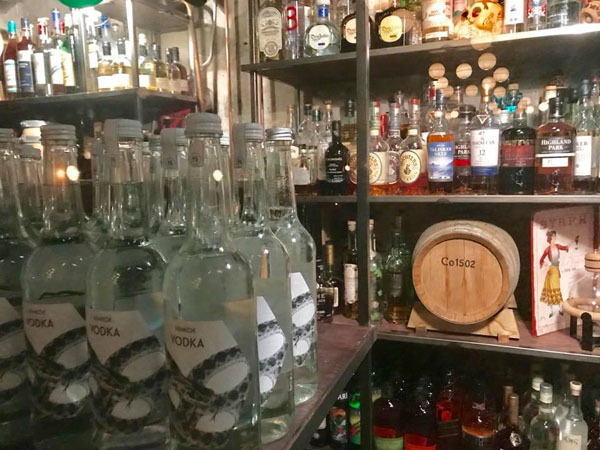 By 9 pm, this roaster turns into one of the best craft cocktail bars with homemade syrups and a lively atmosphere. Book an evening at this modern venue with its slanted sloping roof angles – an architectural gem built in 2008 by the same company that designed the 9/11 Memorial. The opera house is said to be built like an enormous glacier sliding or perhaps rising in the fjord. White granite and Italian marble create the illusion of glistening ice. Visitors are encouraged to scale the building’s exterior stairs for unique perspectives of the city as well as head to the roof for panoramic views. View close up, without crowds, the famous works by Edvard Munch like The Scream and Madonna. Browse the exceptional collection of Impressionist and French owned paintings by Monet, Manet, Degas, Cezanne, Picasso, Matisse, and more. Other iconic Norwegian paintings are on display, like Tidemand and Gude’s Bridal Procession on the Hardangerfford and Harald Sohlberg’s Winter Night in the Mountains. For the modern art lover who likes to think outside the box and find some shock and awe with artistic ideas, the ever-changing collection boasts work from young artists from around the world and is considered one of the best in Northern Europe. The building itself is a piece of art. Designed by Renzo Piano, three pavilions are connected by one roof and is a quick walk from The Thief. Open every day but Monday, don’t miss their room of laureates, with interactive tablets telling the stories of each person or organization to win the Peace Prize. An eye opening and timely interactive exhibit on the atomic bomb, its history, and effects was on view, leaving us with a scary sense of the death and disease caused by this horrific act of war. 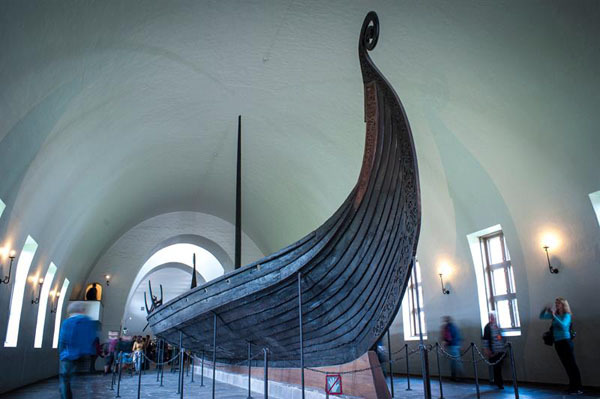 Learn about the history of preserved 9th century Viking ships that were used as burial coffins, many filled with animals and other offerings. These ancient ships were found buried, with their masts sticking up out of the ground. The first time we found this museum, we took a short boat ride from Oslo Fjord to Bygdøy Peninsula, then walked through the neighborhood, giving us a glimpse of Norwegian life. Admire Gustav Vigeland’s lifework with more than 200 sculptures in bronze, granite, and wrought iron in Frogner Park. It is the largest sculpture park made by a single artist.